What is the difference between Coffee Tamer and CalciBlend? granules for introduction to doctors' offices and pharmacies. What are the ingredients in CalciBlend and Coffee Tamer? They contain calcium carbonate and a small amount of potassium and magnesium. They contain NO Aluminum, Cholesterol, Sugar, Glutens, Lactose, Fat, Yeast, Corn, Milk, Wheat, Egg, Soy, Starch, Calories, Caffeine, Preservatives, Artificial Flavoring. They contain a small amount (Less than 1 milligram of sodium per serving) of CMC Sodium - brand name (Solutab) a wood product used to accelerate the dissolve rate of particles and MCC Micro-crystalline Cellulose-brand name (Tabulos) used for binding together as a granulation aid. Their ingredients are recognized as safe by the FDA, consisting entirely of GRAS (generally regarded as safe) ingredients. GRAS ingredients have been tested a minimum of 20 years by the FDA for safety in consumer products. All of the ingredients and processing are 100% USA for all of our products. All ingredients are pharmaceutical grade and defined by the FDA. Who invented Coffee Tamer and CalciBlend? Macit Gurol, Founder & Chief Scientific Officer of Tamer Laboratories, is inventor of record on 19 U.S. patents, numerous international patents and 12 patents pending. Mr. Gurol invented and patented the pH Sciences platform technology that is used in the pH Sciences Products. After concluding that heartburn was caused by the high acid content of coffee, Mr. Gurol invented a food additive (he called "Coffee Tamer") to control acid in foods and beverages. It wasn't until other people tried the product and told him of additional health benefits they experienced while using his food additive that he realized the magnitude of what he had discovered. Continuing years of research has revealed various delivery mechanisms, formulation improvements, and other applications that provide optimal effectiveness to reduce acid in different parts of the body, not just the traditional acidic environment of the stomach. Through variations in the formulas, ingredient binding processes and product forms (granulated powder and tablets), the former "Coffee Tamer" grew into a list of products that can alkalize the entire body, target specific areas of the body (urinary tract and digestive tract) or alkalize food on contact before it is eaten. In 2008, pH Sciences acquired Mr. Gurol's patents. According to Mr. Gurol's instructions, every pH Sciences product is made from FDA-rated Generally Accepted as Safe (GRAS) ingredients. Only 2% of all dietary supplements meet these stringent standards, assuring the consumer of pure and safe products. The effectiveness of pH Sciences' products was made possible only by the platform technology-manufacturing equipment and production processes developed by Mr. Gurol and patent protected by pH Sciences. Consequently, the ingredients in the formulas have a 99.9% consistency among each tiny granule, 100 times higher consistency that required by the FDA resulting in controlled delivery of alkalization where and when you need it. The ph Sciences products have shown no negative side-effects. In 2009, Heartburn-Help LLC acquired the original "Coffee Tamer" brand and worked with pH Sciences to develop CalciBlend for introduction to General Practitioners, Gastroenterologists, Urologists, Dentists and the general public. Will CalciBlend or Coffee Tamer change the flavor or aroma of foods or beverages? CalciBlend or Coffee Tamer does not affect the flavor or aroma of foods or beverages. In certain foods and beverages, such as vinegar based dressings, coffee and citrus based foods, it may slightly reduce the acid bite. How do I use CalciBlend and Coffee Tamer? With the exception of the Calciblend Tablets, the amount needed for each person is very individual. Start with the following and increase or decrease the amount as needed. 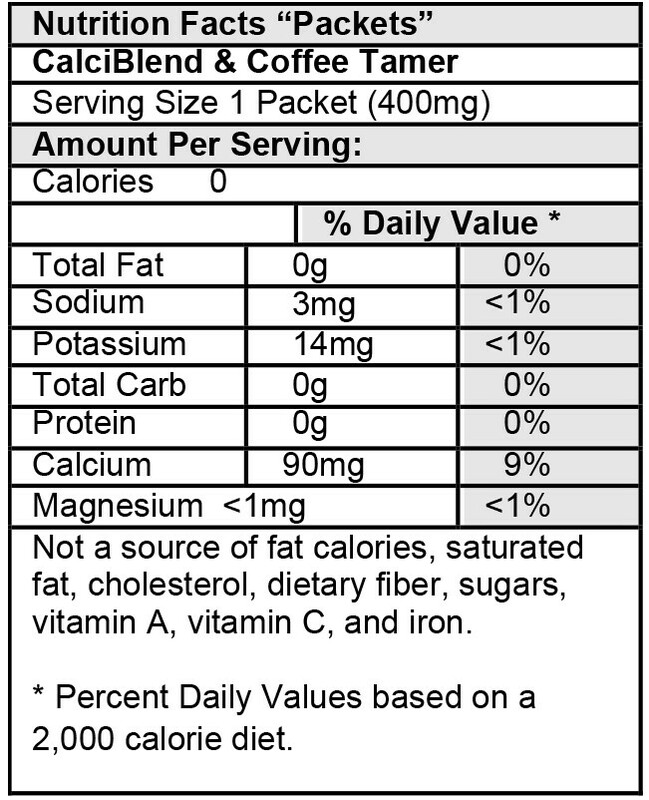 In Beverages: One or two packets per 8oz of beverage. Stir for 30 seconds. On Food: Two to three packets per medium slice of pizza. 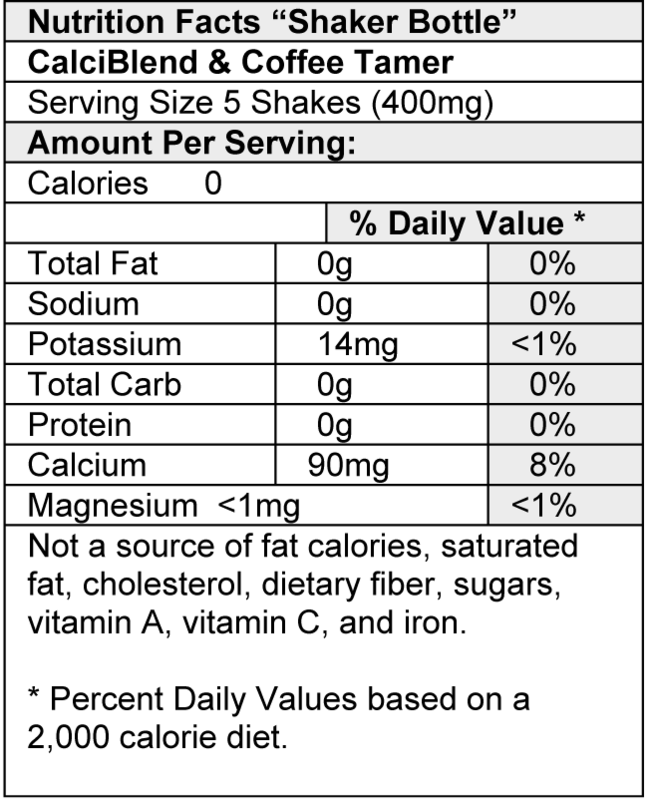 Approximately three to four shakes equals one Coffee Tamer packet (200mg). 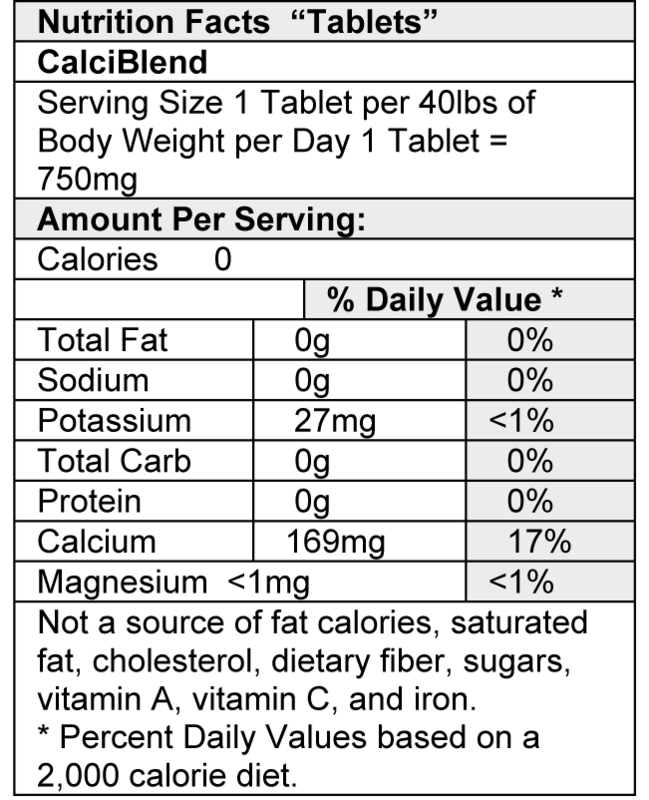 One tablet for each 40 pounds of weight. (Do not exceed eight tablets a day). You can use CalciBlend and Coffee Tamer on prepared foods or while cooking. When adding CalciBlend and Coffee Tamer while cooking, use 1/2 teaspoon for each serving. 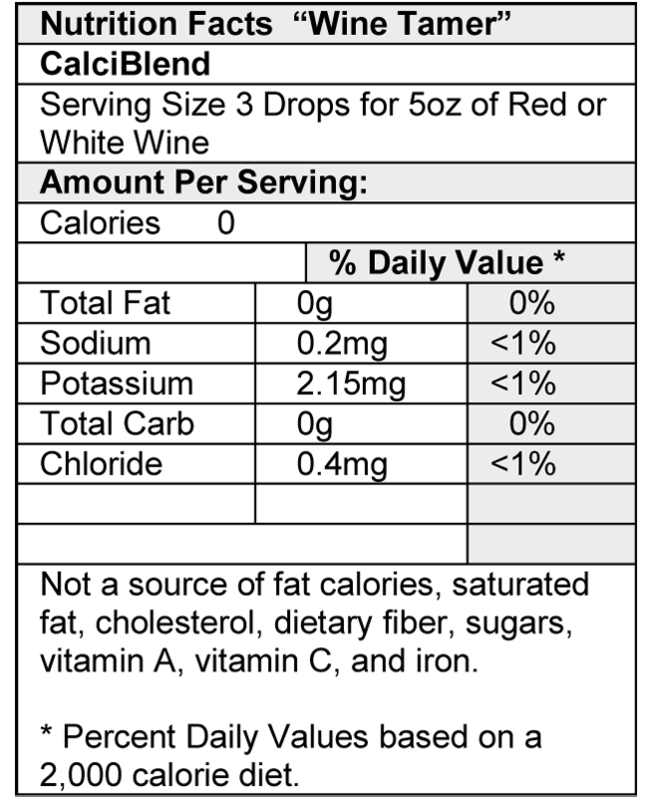 Can CalciBlend and Coffee Tamer be used in Wine? Yes. Both products can be used in any acidic beverage or food. Can I use Calciblend and Coffee Tamer as an antacid? Yes. To relieve minor heartburn or indigestion mix 3 packets in half a glass of water. Who can benefit from CalciBlend and Coffee Tamer? Anyone suffering from Heartburn, Interstitial Cystitis, Periodontal Disease or Erosion of Tooth enamel should reduce their acid intake. CalciBlend and Coffee Tamer will quickly do this without changing the flavor of food or beverages. Why do the granules not completely dissolve in cold beverages? CalciBlend and Coffee Tamer granules contain calcium carbonate as a carrying agent for the active ingredients. Calcium may not dissolve completely in cold beverages. However, the active ingredient which neutralizes the acid dissolves upon contact, so, you can be assured that the acid in the beverage has been neutralized. I found a few empty packets in my Coffee Tamer / CalciBlend order! The packets are filled at very high speed. Every once in a while there may be a few empty packets in each bundle. The bundles are filled by weight. Since empty packets have very little weight, each bundle will have extra packets making up for any empty ones. We also include a few extra packets to ensure that the total amount purchased is received. Heartburn-Help LLC offers a full refund for the product if you are not satisfied with the products for any reason. Please contact us to receive refund instructions.